A Jaguar XFR recently suffered electrical failure while in my care, and its electronic shift lever became locked in Park. When the time came to tow it, the car had to be in neutral. Here's the trick to shifting it. This is a Jaguar XFR. Like many modern cars, it sports an electronic shift lever — a digital control that offers no mechanical connection to the transmission. The control that Jaguar uses, dubbed JaguarDrive, is part of an electronic cockpit ballet that heralds the moment when the car's ignition is switched on: When you hit the start button, the shifter rises from the console, the climate vents rotate forward, and the center touchscreen comes alive. This shift lever is found on every current production Jaguar. Many luxury manufacturers use a similar device, all of them designed to make the act of driving more emotionally involving and less like actual work. This is fine, except when stuff breaks. The XFR you see here is a press car that lived at my house for a week. The XFR is the hotted-up version of the ordinary XF, a supercharged, 5.0-liter, V-8-powered, aluminum-block monster that produces an eye-bleeding 510 hp at 6000 rpm and 461 lb-ft of torque at 2500 rpm. It weighs 4400 pounds and has a Roots-type Eaton blower the size of Kansas. It is hell on exquisitely trimmed, long-travel, kind-of-looks-like-a-Lexus wheels; it will burn its rear tires into figgy pudding if you so much as look at it funny; and I love it. Which is fine, until stuff breaks. Near the end of the XFR's stay with me, I drove it into the city for dinner. When I returned, I turned the lights off, locked it, and left it on the street in front of my house. The next morning, I walked out to move the car for street cleaning, it was dead — D-E-A-D, dead. Mysteriously, it was also unlocked. Nothing — the electrically opening trunk, the electrically actuated door locks, the proximity-sensor-opened glovebox — worked. The keyless-start key fob — modern Jaguars require no ignition key — was essentially useless. Being a resourceful kind of guy, I went looking for the owner's manual in order to the find the battery. Ha! I thought, I must've just left a light on and drained it. I'll jump it. And then I noticed that everything was off. I then remembered that the manual was in the glovebox, which wouldn't open. Five seconds of guessing and two minutes of prowling unveiled a plastic cover panel in the trunklid, hidden next to the license-plate light where no sane person would find it. 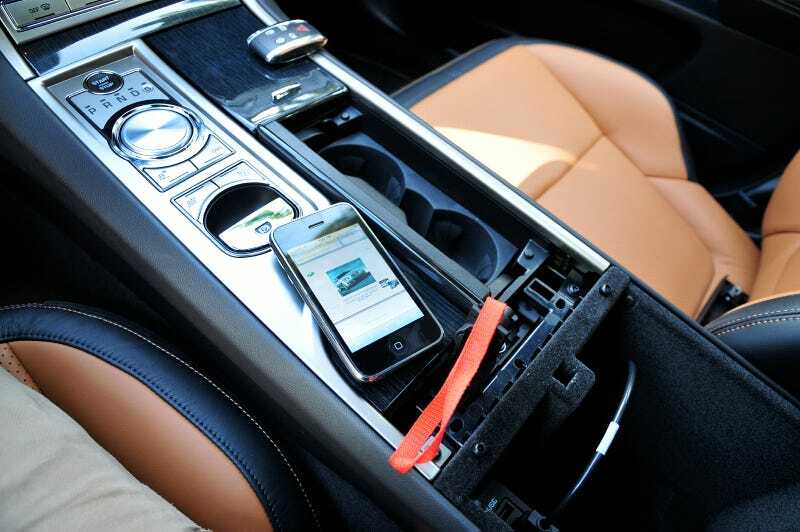 Pop it out, and you can stick the car's mechanical key — which is hidden in the key fob — into a lock, opening the trunk. Boom. Trunk is open, battery is under floor mat, jump box goes on the battery. And car is still dead. Other jump boxes, jumping off a running car, jumping off the neighbor's pickup, nothing made a difference. Being a resourceful, if now slightly irritated guy, I pick up the phone. I call the fleet company rep, who calls a tow company rep, who calls a dude with a pickup and a jump box. He wants to try the jump box, so I let him, despite having asked for a truck with a dolly — a two-wheeled tow trailer you use to tow dead or locked cars. The car is still dead, so Pickup Dude tries jumping it from his truck. I take the opportunity to walk down the street and buy a cupcake, pondering what Joe Lucas would do in this situation. Dude is still trying when I get back. He then leaves, calls a guy with a flatbed (ha! ), who then shows up and tries to jump the car again. No, I say, Do not jump the car. And he tries to jump the car. And he insists that he can't tow it on a flatbed, which is nice, because I had asked for something else. And I consider throwing the remains of my cupcake at him, and then consider shoving the rest of the day down the toilet and walking to the nearest bar. Which is when Flatbed Dude tells me that, if I can get the car into neutral, he can get it on the bed. Which is fine, except when stuff is... well, you know. So Flatbed Dude offers to jump the car ONE MORE TIME, and because I am a patient man who totally doesn't throw things at strangers on a busy street in broad daylight, I say yes. It doesn't start — though now a relay in the dash has started getting all tweeky and loud and begun yelling clickclickclickclick every time you hit the start button — and Flatbed Dude gives up, calls a dolly truck, and tries to turn his truck around on my narrow street. This takes a while, and because I want to make sure he doesn't hit the XFR, I sit. I get out my iPhone, Google "Jaguar XF dead battery neutral," and start reading. This is Ford/JaguarLandRover's internal shipping document for the XF. It contains everything from how to start the car (shipping people are apparently not the sharpest knives in the box) to... wait for it... how to get it into neutral with a dead battery. Step 3: Pull the Red Strap, Win Fabulous Prizes! OK, no, there's no prizes. (I originally had a crude joke here, one that included the phrases "yanking it," "easy," and "prom night," but this is a family website, so you get a lame crack about free stuff.) When you lift that lever with your foot on the brake, it will pull on a cable, shifting the transmission into neutral. It will feel like nothing has happened — there's no catch or audible signal — and the shift lever will stay down and locked, but the car should now roll freely. Reassemble, grumble something about unintuitive engineering, and tow away! Wrapping it Up: Wait, Huh? Random related thoughts: Really, who's expected to do this? What happens if you actually need to move the car and you don't have A) a history of finding weird-but-useful stuff in the bowels of Google or B) the willingness to tear your car apart? Would an easily accessible lever under the dash or in the console really have been more difficult? Other manufacturers must have the same problem — how do they solve it? Regardless, I do all of this, I get the car to roll, and then Flatbed Dude, who is by this point almost turned around (really, it's a narrow street), comes over to investigate. "Ahh!" he says. "That's good! Lemme try jumping it one more time!" Grumblgrumblefrumpgrumble... why yes! Try that! Please! Can we put it on the truck then so I can wander inside and bang my head against the wall? That would be so very awesome! And you know what? After all that mess, after six million jumps and nothing, the damn thing starts. At which point Flatbed Dude gives me a knowing, superior look and proceeds to turn the truck around, for ten minutes, again. The fleet company called me the next day and swapped the XFR with another Jaguar, this one an ordinary XF. Twelve hours later, it also suffered electrical problems and refused to start or take a jump. This time, I just went inside, smacked myself on the head, and lay face-down on the couch. It was easier that way.